← Brazil Bugs #3 – Gorgulho Enorme! I found mais dos percevejos (more of the leaf-footed bugs) on the still-unnamed pink flowering shrub in back of the hotel in Campinas, Brazil. Not only am I convinced that they truly do belong to the family Coreidae (for the reasons mentioned in the earlier post and below), but also that despite the different color patterns shown by the two individuals in that post that they are indeed a single species. I also found the above individual, representing an even more heavily melanized version than the two shown previously. In looking at a large number of individuals on the shrubs (and subsequently encountering them in a different part of Campinas over the weekend), it became clear that there were not just two distinct color forms but a broad range of variability. I could believe maybe two species occurring together on a common resource, but it seems unlikely that each color variation represents a different species. Thus, it now seems that there is one highly variable species visiting these flowers. I had an idea on how to find the name of this species that almost worked. 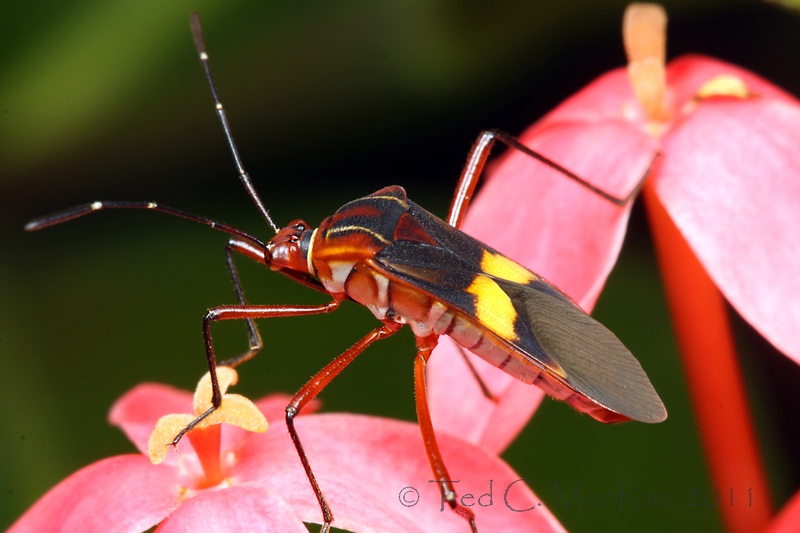 Rather than Googling “leaf-footed bug” or “Coreidae,” I tried “percevejo” instead, along with Brazil or Brasil. There were 3 or 4 photographs that showed up in the images search that I recognized instantly as belonging to the same species. Unfortunately, none of the links where the photos were found gave any information more specific than family (all, however, agreeing with family Coreidae). I think it’s time to send an email to Harry Brailovsky, a coreid specialist at the Instituto de Biologia (UNAM) in Mexico City. Photo 1: Canon MP-E 65mm 1-5X macro lens (ISO 100, 1/200 sec, f/13). Photo 2: Canon 100mm macro lens (ISO 100, 1/200 sec, f/16). Both photos: Canon 50D, Canon MT-24EX flash w/ oversized DIY concave diffuser. Typical post-processing (levels, color, unsharp mask). Last minute edit: I just heard back from Harry Brailovsky as I was ready to post (thank you Harry!). The insect is, indeed, a species of Coreidae, which he identified as a member of the genus Hypselonotus. I did some searching online to see if I could find any additional clues as the species identity – I found no images that looked right but did find this key to the Hypselonotus of Costa Rica. The key relies on some ventral characters, and I’m a little uneasy about using it for something from southern Brazil, so I think I’ll just wait until Harry has a chance to look it up when he returns to the museum. Second update 1/26/11: Harry has confirmed the species as Hypselonotus interruptus, which was mentioned but not included in the key that I linked to above. The only online images I have found of this species are at this link. Either Harry is wrong (unlikely), the photos in the link are misidentified (maybe), or the species is enormously variable (perhaps quite likely). 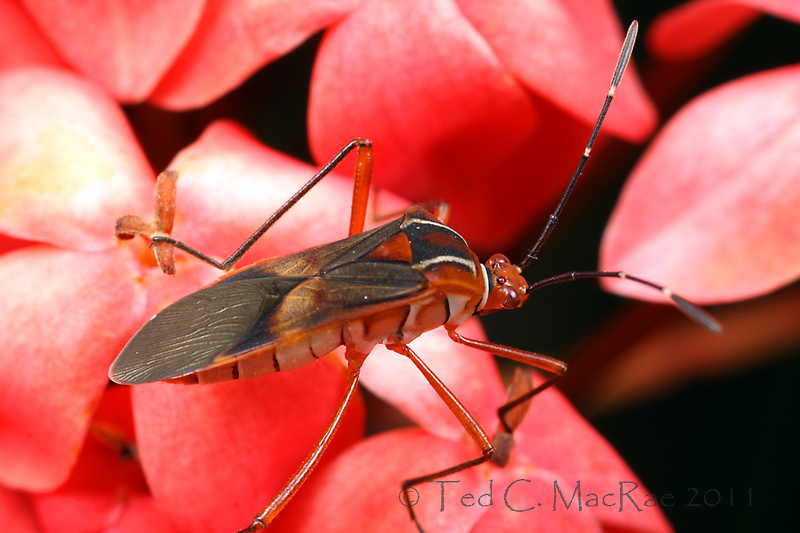 This entry was posted in Coreidae, Hemiptera and tagged Brazil, Brazil Bugs, entomology, insects, leaf-footed bugs, nature, science, true bugs. Bookmark the permalink. Didn’t find it in the Biologia either! It looks like your finding some great bugs just around your hotel! I would like to see a general view of the shrub you are finding these bugs on, I’m curious what it is. I’ve still got some other insects from around the hotel to post, and then this past weekend I went to a few other ‘wilder’ places in the Campinas area and found even more cool things. The hotel staff gave me a name for the bush, but a Google search on it hasn’t turned up anything so I think that’s a dead end. I’ll take some photos of it tomorrow if I can – who’d a thunk the insects would be easier to ID than a common ornamental shrub! I’m with Adrian – Let’s see some foliage, etc. Something in Euphorbiaceae, maybe Jatropha sp.? Jatropha has a similar appearance, but the flowers in my bush are four-petaled rather than five and have a much longer tube than the Jatropha flowers I’ve seen photos of. No milky sap either – it really doesn’t strike me as something euphorbiaceous. I find it so interesting that highly variable forms could be reliably placed in a single species, and yet other taxa(such as Tetramorium “caespitum”) that look almost identical are actually a tangled mess of multiple cryptic species. Systematics is just a never-ending battle, isn’t it? Can’t argue with that. I suspect this might be a rather common and widespread species – as such its success may be fueled by having sufficient variability to adapt to a range of environmental conditions. Of course, just because “we” say something is a single species doesn’t necessarily make it true! Nice shots, Ted! Are they still in drought conditions down in southern Brazil? Thanks, Alex. It has rained almost daily since I’ve been here – usually in the late afternoon or early evening. Anyway, it turns out Jatropha has a 5-lobed stigma. Another look has me thinking Rubiaceae, but the 3-lobed stigma says otherwise. Still a mystery. What was the Brazilian name for it? I don’t remember what they called it – seemed irrelevant since the name wasn’t showing in any searches. Very nice shots, Ted! The flowers could be that of Ixora. I’m with Ani on Ixora being a possible genus for the shrub – commonly used as a hedging plant in the tropics, and well known as a popular nectar source. I thought maybe Ixora, too, but that is supposed to have a bifid stigma, and these are clearly trifid. Strange! Everything about Ixora – color, foliage, shape, common use as ornamental planting in the tropics – is right. Except for that stigma! I wonder if this might be a horticultural variety with some sort of mutant stigma, because everything else about it is right. That’s the site where I key I linked to came from. Harry Brailovsky did write back today to say that the bug is Hypselonotus interruptus, which was mentioned but not included in that key. The only online images I have found of that species are here. Either Harry is wrong (unlikely), the photos in that link are misidentified (maybe), or the species is enormously variable (perhaps quite likely). Hypselonotus is a bit tricky because the last two substantial works (Horvath, 1913 and Whitehead, 1974) consider the genus to contain 20 and 9 species respectively . Both papers rely on small femoral spines for identification. It’s a genus that would benefit from some good molecular work. I had a look in the BMNH, London collection and there are few recently reliably identified specimens but they all have pale yellow lines on the pronotum with the red triangular marking in the middle. None of the specimens identified as H. interruptus had the pronotal pattern like those in the Forestry Images website. Hi Laurence – thanks for stopping by and for the great information. Any ideas on the identity of the Forestry Images specimen? There is no attibution for the source of the ID. It’s a genus that would benefit from some good molecular work. Nice website! We need something similar for Buprestidae. According to Whitehead (1974) the colour variation in Hypselonotus interruptus is the most complex in the genus and currently has 10 junior synonyms. I looked in the collection and at Biologia Centrali Americana, Plate 14 Figures 25-27, which has illustrations of three H. interruptus synonyms, H. concinnus, H. concinnus var. propinquus and H. atratus. The BCA illustration and the type series of H. atratus look like the Forestry Images specimen. Okay – Thanks for the additional information. it looks like the third scenario (widely distributed and highly variable species) is the winner. I should remember to check BCA – what a nice resource to have all the color plates online!